"My boy cousins used to sit my older brother and me down and take us through a film-studies course. It included Tremors, The Goonies, and, of course, Star Wars. That was when it began: sitting cross-legged watching as the opening crawl goes up the screen." "My agent called me up and said, “There is a tremendous female lead in the new Star Wars film, and I think you’re really going to like it.” The opportunity to play someone determined, who’s trying to find her skills as a leader; to be in a fantasy movie; to be able to do a leading female role in a film of that scale—that’s very, very rare." "She’s a bit of a wounded animal when you meet her. There were moments when she’s been blown over, she’s scrambling to get up, and she falls. It’s important that she’s not perfect. [The director] Gareth [Edwards] and I, we want to see her being a human being....She’s obviously completely her own woman, but I felt like [she] was a rather beautiful blend of Luke Skywalker and Han Solo—and that came up in discussions around designing the costume." "Everyone wanted to create a character that was not in any way objectified. We didn’t want to sexualize Jyn...We don’t even see Jyn’s arms! That’s not her priority. 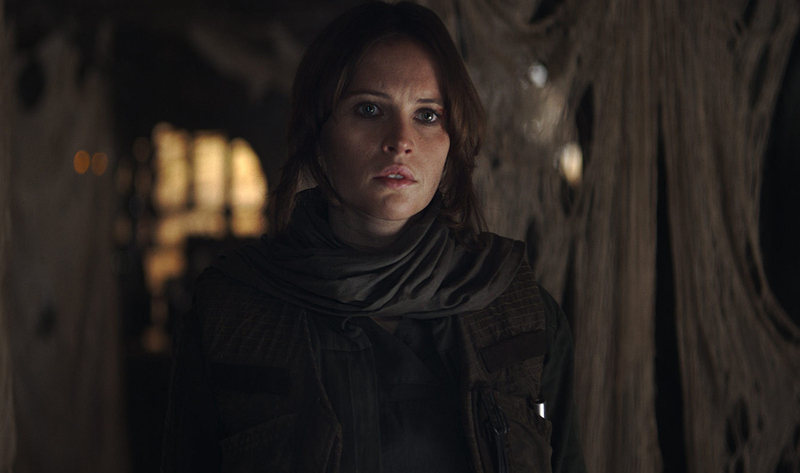 She’s a survivor, and she has a mission to complete...Gareth said very early on, “I want guys to watch it and be like, ‘I want to be Jyn!’” A female friend of mine said, “I love that Jyn looks how we look, with trousers and a long-sleeved top.” We aren’t in hot pants. When do women walk around wearing hot pants?" "I’m small. I’m petite. But I’m a bit of a fighter inside. In my work I fight for, I hope, showing women in a true way. They’ve got brains." You can read the entire interview with Felicity Jones over at Glamour.